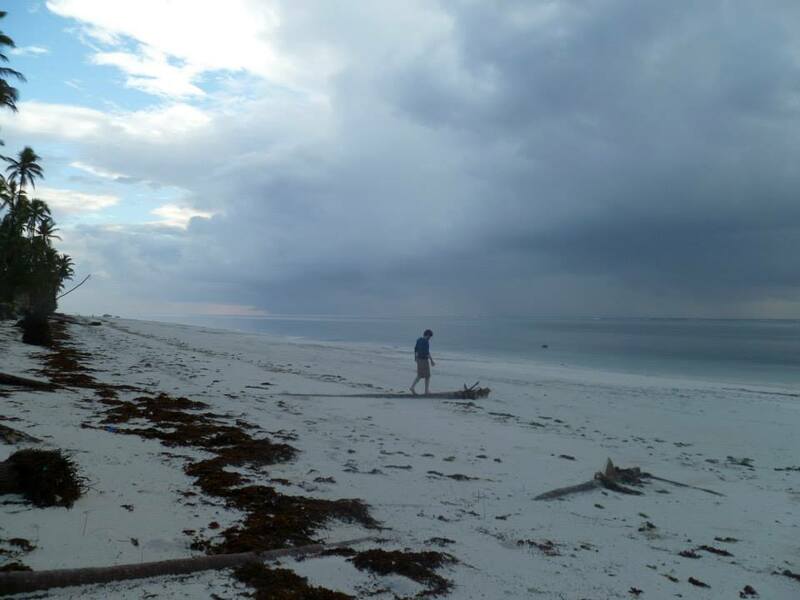 This is the eleventh installment of my summer 2013 guest blogging series with the theme “Somewhere, Beyond the Sea”. Let me briefly introduce today’s blogger, who was most generous in sharing an earlier post with us. John “The Wine Raconteur” was new to blogging, like me, when I stumbled on his writing. We both had started our blogs in May 2012. His was actually one of the first blogs I came across and followed. We have since interacted on numerous occasions and met in person. I consider him a friend. 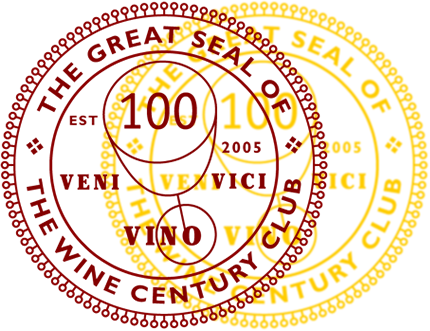 In his blog, The Wine Raconteur, he explores restaurants, foods and wines. For John, wine and food is about moments and memories, not scientific analyses or tasting notes. With this approach, he covers an under-appreciated side of wine and food writing. His undying curiosity and vast knowledge in wine as well as the combination of fresh and old memories keeps me coming back to his blog again and again. Thank you, John! It is my honor and privilege to make another appearance on the pages of this popular wine blog. My name is John and I write about wines as “The Wine Raconteur” and I am guest writing another article for my good friend Oliver at his request, while he and his wife are on holidays. The word “raconteur” is an old way of saying a story teller, and most of my articles are woven around a memory and a wine, as I do believe that wine should be enjoyed and there should be a great memory of the occasion. As I stated in my other guest article, Oliver gave me the theme of “Beyond, The Sea” and I have presumed that he meant that I write about a non-domestic (American) wine. Since my last article was across the pond about a French wine Chateau Latour 1961 a famed wine from the Commune of Pauillac of the Medoc, I thought I would traverse the other body of water and discuss a wine from the Barossa Valley in South Australia, Australia. I was managing a clothing store, that was popular at the time, and we had plenty of customers that not only enjoyed quality clothing, but also quality wines. This was a major “pro” for the store, but unfortunately there were a few more “cons” to this establishment, but that is not germane to my story. There were always some beverages on hand for the customers, and there were times when the customers brought in their selection to share as well. One memorable day a customer brought in two different vintages of Opus One wine from Napa Valley, suffice it to say that it was a great day, but not business wise per se. Let me just add, that one of my unlisted duties when I was hired was the ability to wash and maintain a collection of crystal wine glasses, as we had both stemmed and stem-less wine goblets for the customers. Thankfully most of the customers that drank beer did not require a glass. Sometimes there were discussions about wine and other subjects, with the least interest in adding to one’s wardrobe at the moment, but that was a rare time. I have found that the subject of wine is a great “ice-breaker” when meeting new people and it is popular discussion point and that some people have very strong opinions of certain wines and areas. As I sit here looking at a wooden box which is my temporary muse, that at one time held a magnum of wine this is another story. The marketing of magnums especially in individual wooden wine boxes, I think is a great plus, while it may add a small cost to the total package, I do believe it proclaims to the customer that yes, this wine should be taken seriously. 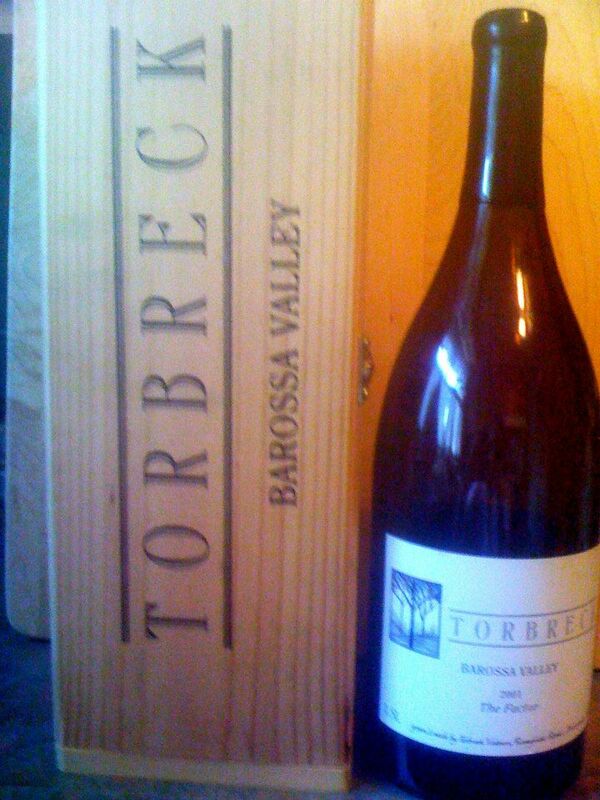 The wine was a Torbreck “The Factor” 2001 from the Barossa Valley in South Australia. Torbreck Vintners, the winery was founded by David Powell in 1994 and he signed the back label of the magnum near the numbering of number 195 out of a count of 240 magnums that were bottled of this wine. Mr. Powell named his winery after the Torbreck forest in Scotland. The wine “The Factor” was his homage to the great old Shiraz vines of the Barossa Valley and one of the mainstays of most of the wineries of this area. The manager on a Highland estate is referred to as “The Factor,” hence the proprietary name. This particular varietal grows well in several parts of the world, but I must say that Australia has been a big promoter of this type of wine, and now other areas have also had great results with it as well. One of the reasons that this wine is so full and rich in flavor is that it spent twenty-four months in French Oak barrels with thirty percent of them being new. This is not a wine that was made for quick consumption, as the nuances and traits of these old vines were allowed to mature in the barrels properly. Torbreck Vintners also produces several other varietals as well as some other “named” wines. As my regular readers know, I tend to soak off labels and store them in scrapbooks as an easy way to remember wines that I have enjoyed. Also many other labels have become the “wallpaper” on a couple of walls in my cellar as well. This particular set, alas though empty now, has been kept intact as a curio in my cellar and a great talking point. I guess my collecting interest goes beyond just cellaring and drinking wines with good friends. I find it almost impossible to soak off today’s labels. The glue is nowadays terribly strong. Any magic methods? Having tasted the Factor it was a great label. But, here in Malaysia, it tends to be a bit pricey so as an alternative I would recomend their Old Vines label, a blend of greanche, shiraz and mouvedre. Thanks for thag tip, James! I have a couple bottles of their Run Rig waiting patiently for me… I just wrote a post about shopping on my site, so this question is stuck in my head now – what clothing shop is this that has wine and beer for customers?!? Please tell me it’s still open and here in MI..
Actually I am at another store, that features the same type of refreshments to enhance your shopping experience, though I am there more as a consultant and you would have to contact me privately for my hours, and it is within a half hour of Ann Arbor. Thanking you for notice.